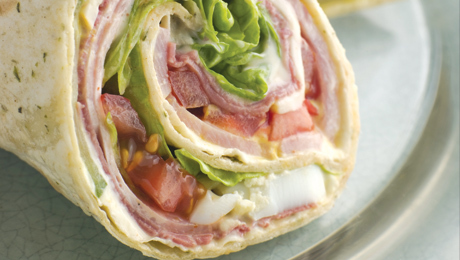 Tortilla wraps are versatile and make a good alternative to bread. Spread tortilla wrap very lightly with a little bit of mayonnaise and then place some of the mixed lettuce leaves on top of that. Top with sliced ham and tomato, sprinkle grated cheese on top. Roll them up tightly and secure.